Singles Knockout winner - Dave Hambley. Singles Knockout runner up - Andrew Cass. Doubles Knockout winners - Brian Harland & Mike Beedle. Doubles Knockout runners up - Andrew Cass & James Gilpin. Heaviest Fish in a competition - Brian Harland - 9 lb 10½ oz (9th January 2011). Heaviest Fish out of competition - Brian Harland - 8 lb 00 oz (15th February 2011). Christmas match winner - Colin Stainthorpe - 3 lb 03 oz - 1 fish. Christmas match Heaviest Fish - James Gilpin - 1 lb 10 oz. Greatest number of fish - Rob Allison - 93 fish. Heaviest Bag of Fish - Matthew Garbutt - 27 lb 09 oz (7th November 2010). Total weight for the season - 1,738 lb 01 oz. Total Number of fish - 939. The start to a new season saw a good turn out of anglers with a reasonable weigh in coming back to the scales. New member Matthew Garbutt came straight out of the blocks with a good bag of five fish for 7 lb 12 oz. Again, a good turn out of anglers, with an increased weigh in. Paul Short took the match with an excellent bag of fish, five for 13 lb 09 oz. 11th Colin Stainthorpe 2 fish for 1 lb 03 oz. Fishing a low water match but calm conditions results were down on the last two matches. But man in form at the moment Paul Short took the match with three fish for 4 lb 12 oz. 7th Dave Perrett 1 fish for 1 lb 02 oz. A match fished over high water and 3hrs down saw this seasons best weigh in so far. Brian Harland took the match with five fish for 10 lb 15 oz. A match fished over high water with a slightly growing swell, saw 15 anglers putting fish on the scales. Denis Thompson won with 6 fish for 10 lb 09 oz. 15th Bernard Vasey 1 fish for 15 oz. This match was fished over a dead low water with little movement or colour. Rob Allison won with five fish for 4 lb. 14th William Atkinson 1 fish for 09 oz. A heavy north/north westerly gave anglers plenty of movement and colour combined with a low water match. This resulted in the best weigh in for several years. Dave Smith came out on top with a fine bag of ten fish for 25 lb 09 oz. 20th William Atkinson 1 fish for 09 oz. The heavy conditions over high water and 3.5 hrs down gave another very good weigh in. Ben laws continued a good run to win with nine fish for 26 lb 02 oz. 18th Colin Stainthorpe 1 fish for 10oz. A high water match with very little movement gave a much reduced weigh in. Matthew Garbutt won with six fish for 5 lb 05 oz. 8th Mike Vasey 1 fish for 05 oz. A match fished up to high water with calm conditions only brought eight anglers to the scales. Rob Allison won with four fish for 6 lb 13 oz. 8th William Atkinson 1 fish for 13 oz. A match fished across low water and back up saw slightly more fish than the previous match, in what can be the best month of the season. Rob Allison won with a fine bag of nine fish for 25 lb 02 oz. 13th James Verrill 1 fish for 09 oz. Anglers fished a fast ebbing tide with both movement and colour. A very good nights fishing was had by most. Matthew Garbutt shone with a fantastic bag of thirteen fish for 27 lb 09 oz. 19th Tim Wright 3 fish for 2 lb 06 oz. A match fished from high water down with a dying swell. Matthew Garbutt showed his angling skills with ten fish for 19 lb 05 oz. 16th Andrew Cass 1 fish for 06 oz. A flooding dead tide up to high water with a slight swell saw Ben Laws continue to fish very well, with four fish for 9 lb 02 oz. 12th Andrew Cass 2 fish for 1 lb 01 oz. 15th Paul Short 1 fish for 05 oz. Appeal:- If anyone has any records or photos please could they let us know as some how WSAA records have been mislaid. Hopefully the Whitby Gazette will be able to supply us with a submitted report www.whitbygazette.co.uk/ I'm hoping the esteemed Sports reporter Duncan Atkins can help us out. ?? - Tim Wright 0 lb 09 oz. This match was a day match fished as the Whitby Open a flooding match with a slight growing sea but little colour saw Colin Stainthorpe win (the members club results) with five fish for 12 lb 14 oz. 11th Tim Wright 1 fish for 09 oz. A match fished 1 hour into the ebb and down gave Dennis Thompson a fine win with a six fish bag of 23 lb 14 oz. 11th Mike Beedle 1 fish for 2 lb 02 oz. A match fished up to and over high water with a growing sea and snow fall saw most anglers fishing very locally due to poor road conditions Dennis Thompson won with three fish for 7 lb 00 oz. 10th Mike Breckon 1 fish for 1 lb 10 oz. Heavy easterly conditions combined with heavy snow fall made for a tough match with only three anglers making the scales Dave Hambley won with two fish for 3 lb 15 oz. 3rd Ben Laws 1 fish for 1 lb 09 oz. This match was fished down to low water with a nice n/nw swell gave a better weigh in than the previous few matches Andrew Cass won with three fish for 12 lb 09 oz. 10th Peter Horbury 1 fish for 11 oz. A match fished with a ebbing tide but a growing nw sea and snow melt gave anglers a tough night. Andrew Cass won with a single fish for 2 lb 12 oz. 2nd P Dryden 1 fish for 1 lb 08 oz. This match was fished 2 hours either side of high water. A slight motion and colour yielded a slightly better result. Dennis Thompson increased his overall lead with fine bag of seven fish for 17 lb 09 oz. 8th Paul Kilpatrick 1 fish for 12 oz. A flood match with little tide and lots of snow melt gave a poor weigh in Matthew Garbutt won the match with a single fish of 2 lb 15 oz. 7th Brian Harland 2 fish for 11 oz. This was the clubs annual Christmas Match Anglers fished an ebbing tide from 2pm to 7pm, conditions looked good for most of the popular marks but results were poor. Colin Stainthorpe won with a single fish of 3 lb 03 oz. 5th Dave Perrett 1 fish for 0 lb 05 oz. Again conditions looked good but the freezing weather and snow melt seems to have moved the fish to deeper water Dave Perrett won with three fish for 9 lb 03 oz. 3rd Mike Vasey 1 fish for 1 lb 05 oz. The first match after the Xmas break was fished with a nice n/nw sea and plenty of colour, anglers fished down to low tide and 1.5 hrs up Phil Mead won with three fish for 4 lb 13 oz. 8th James Verrill 1 fish for 1 lb 09 oz. This match was fished into the ebb with very little swell but colour was to be found. Only six anglers made the scales with Paul Kilpatrick winning with a single fish of 5 lb 01 oz. 6th Denis Thompson 1 fish for 06 oz. 1st B Harland 2 fish for 11 lb 6 oz (Heaviest Fish 9 lb 10½ oz) photograph below. 4th P Kilpatrick 1 fish for 3 lb 1 oz. Brian Harland 9 lb 10½ oz Sunday 9th January 2011. Photograph by Peter Horbury. 4th Paul Kilpatrick 1 fish for 15 oz. Match fished over low water, 1930 hrs, slack tide, poor ebb. Light breeze south south west, slight long distance swells. Clear cloudless night added to a poor evenings fishing. Another poor nights fishing. 16 anglers fishing an ebbing tide up to low water, full moon and a cloudless evening, little swell with a NWesterly breeze made for less than favorable conditions. Sunday 23rd Jan 2011 Whitby Sea Anglers will be competing in the annual Bell Trophy Competition. A competition between local clubs i.e. Scarborough, Cloughton and Filey. Last year WSAA won, so will be defending the Bell Trophy. On a blustery cold Sunday morning 81 anglers from 8 local teams, fished from 1030 - 1430 hrs, with low water at 1200 hrs. Boundaries were from Argyle Gully (North of Hayburn Whyke Hotel) and Cobble Landing, Filey. All competing for the Bell Trophy, in an inter club competition. The bell comes from the ship 'Sana 1897'. Only five teams weighed in, Brian Harland and Ben Laws caught a coddling and a dab respectively for Whitby, with a total weight of 2 lb 6 oz 2 drams for 3rd place. Some important dates were announced for the coming year 2011. Fords Open 19th June fishing 1100-1600 hrs 2011. Mick Hillaby memorial November 27th 2011. Tonight, fishing up to high water 2100 hrs and an hour of ebb, with a good swell but a strong north easterly wind. Slack tide, fishing over low water 1946 hrs, cold northerly breeze and a little north easterly long distance swell lead to crystal clear water, not ideal fishing conditions. Nether the less a good turn out of anglers tried their best. 5th Brian Harland 2 fish for 8 oz. Fishing a good ebb to low water at 2200 hrs conditions were very arduous for all. Strengthening westerly winds soon flattened what little long distance easterly swell there was. Once again a good turn out of anglers for only three codling. 2nd equal were Denis Thompson and Rob Allison with 1 fish for 1 lb 9 oz each. Sunday nights matched started at high water, with a strong west south west wind, calm sea, but Ben Laws lead the way with an 8 lb 15 oz bag of fish. Fishing over high water, last hour of a flood and two hours of ebb, fish proved difficult to find with anglers travelling far and wide. With a little swell, clear sea, and a chilly south, south west wind blowing, 16 anglers turned out for only two fish. 1st equal Colin Stainthorpe and Dave Perrett with 1 fish apiece of 0 lb 05 oz. Sundays 4 hour match started a little after low water on a slack tide. A strong south easterly wind, shifting more to the south, produced a little localized swell, unfortunately not enough to bring the fish in. 1st Mark Garbutt with 2 fish for 3 lb 09 oz. 4th Peter Horbury with 1 fish for 0 lb 05 oz. Wednesday nights 3 hr match saw a good turn out of anglers with long distance north north east swell, light winds and good cloud cover. With low water at 2100 hr, plenty of colour in the water, anglers had plenty of choice for a fishing mark. With eleven fish caught for a total weight of 23 lb 9 oz, once again Brian Harland lead the way with a bag of 9 lb 7 oz. 1st Brian Harland 4 fish for 9 lb 07 oz. 7th Colin Stainthorpe 1 fish for 06 oz. In other news, WSA's have a trophy for the Heaviest Fish Caught Out Of Match, it was held by Dave Smith with a 6 lb 01 oz cod. 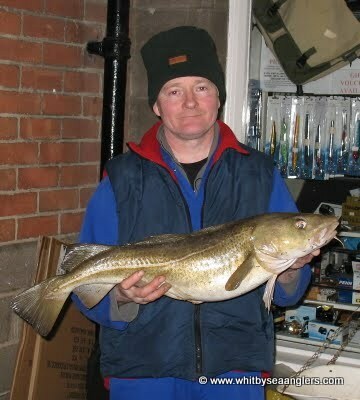 But on Tuesday (15/02/11) night Brian Harland caught a cod of 8 lb 00 oz, leading the way with both heaviest fish in and out of a club match. For those of us who were down Robin Hoods Bay we watched the activity of an air sea rescue helicopter using a powerful search light. Flying extremely low and hovering for ten minutes or so around Castle Chamber, (trawler wreck here). We hope this was an exercise and not a real incident. Sundays match started a little after high water, on the largest tide of the month an impressive 6.1 m. With a reasonable north easterly swell and freshen winds, anglers were hoping for reasonable catches. However the ever quicken ebbing tide proved difficult. One angler reported he nearly lost his catch to a seal, which was following it as he reeled in. 2nd = Ben Laws 2 fish for 4 lb 01 oz. 5th Brian Harland 1 fish for 2 lb 06 oz. Wednesday nights 3 hr match started a little before high water, with the sea looking like a mill pond. Light south westerly winds saw the anglers travelling far and wide for a cliff / pier mark, in search of an odd codling. The closure of the A171 at Stainsacre, due to a factory fire, made those anglers who had traveled south late for the weigh in at 2230 hrs, with one successful angler missing the weigh in. 3rd Andrew Cass 1 fish for 04 oz. Saturday nights change in wind direction to the north west was not enough to make ideal fishing conditions. Sunday nights four hour match started a little before low water on a slack tide. Anglers reported catching plenty of undersized Rocklings and Coal fish, but fish of any size were proving hard to find, but once again Rob Allison lead the way as only four anglers weighed in. 3rd Dave Hambley 1 fish for 2 lb 01 oz 4th Dave Perrett 1 fish for 1 lb 15 oz. So that concludes February and only nine matches left in March before the season closes. Denis Thompson runs a monthly sweep stake with prizes for 'heaviest bag of fish' and 'heaviest fish'. February results as follows. Brian Harland won the 'heaviest bag' of fish caught in a match with a weight of 9 lb 07 oz and Colin Stainthorpe caught the 'heaviest fish' in a match with a fish of 4 lb 01 oz. Wednesday nights 3 hr match saw 16 anglers fishing the last 2 hrs of ebb with very little swell. With a high pressure of 1042mm hanging over the UK and an easterly breeze saw many fishing marks drain off further than expected. But again Rob Allison managed to find a codling. Total weigh in 4 lb 07 oz. With 8 matches left the leader board stands as follows, with 6th, 7th, 8th and 9th changing every match and only trophies for the top eight. Sundays nights four hour match started an hour after a 5.5m high water. Long distance north easterly swell but a bitterly cold south easterly wind. Six anglers weighed in for a total weight of 22 lb 12 oz. 6th Colin Stainthorpe 1 codling for 1 lb 11 oz. Wednesday nights 3 hr match started a 1/2 hr after high water with a strong west south west wind blowing. Plenty of colour in the water but little, to no swell. Wind conditions deteriorated during the match, shifting direction to westerly and increasing in speed with rain and sleet reported. But that did not stop Rob Allison from finding a codling. 4th Paul Short with 1 Rockling for 0 lb 05 oz. Sundays nights four match started with great expectations for all, regular swell sets from a northerly direction, no wind, colour in the water and a very slack flooding tide. High water was at 2146 hrs but it just did not materialise the way we all expected. The swell was sporadic, one minute ideal and the next too heavy and then flat. A heavy frost was developing throughout the cloudless moonlit evening. However that did not stop Brian Harland from finding two codling. Total weight for the match 4 fish for 9 lb 15 oz. 3rd Ben Laws 1 codling for 2 lb 05 oz. Wednesday nights match began 40 minutes before low water on a slack tide. With a good easterly sea running, with many anglers out and about, both club and pleasure fisherman. The wind was gentle east south east with plenty of cloud cover. However, as with an easterly sea the water was gin clear but the cloud cover helped. Dave Perrett caught the fish of the night 5 lb 14 oz to lead the monthly table. Matthew Garbutt was man of the match with a good bag of 4 fish for 11 lb 08 oz which also takes the lead for heaviest bag of the month. Seven anglers weighed in a total of 26 lb 11 oz. BST will soon be here and Sunday nights 4 hr match saw daylight until 1900 hrs which did not help with the already less than ideal conditions. South westerly breeze, sea like a mill pond and reasonable cloud cover obscuring the super moon. Anglers travelling far and wide to Marine Drive, Scarborough and Bempton, Dave Perrett was man of the match with a fine codling of 3 lb 14 oz. 5th Ben Laws 1 pouting (Blegg) for 0 lb 09 oz. Total weighed in 12 lb 02 oz and no change in the top eight positions. Wednesday nights 3 hrs match started a 1/2hr after high water. A slight, but cool south westerly breeze, cloudless sky and some long distance northerly swell, once again saw anglers travelling to Bempton and Marine Drive, Scarborough. Ben laws was man of the match with two lesser spotted dog fish from Bempton. Total weigh in for the evening was 14 lb 12 oz with 7 anglers weighing in. 2nd equal Colin Stainthorpe 2 fish for 2 lb 09 oz and Dave Hambley 1 codling for 2 lb 09 oz. The penultimate match of the 2010-2011 season. BST and the sun did not set until 2000 hrs, so only 2 hrs of darkness for last nights match. Long distance, intermittent northerly swell and a gentle south westerly breeze, saw a good turn out of anglers eagerly anticipating a good bag of fish to finish off the season with a flurry. James Verrill, did just that and was man of the match with a bag of 7 lb 10 oz. Total weigh in 16 lb 03 oz. 7th Dave Perrett 1 rockling for 04 oz. Wednesday nights 3 hr match was the last match of the season with anglers keen to finish on a flurry. The long distance northerly swell, that had been evident during the day was knocked back by the southerly wind. Anglers fished down to low water and a 1/2 hr of flood. Only five anglers weighed in with a total weight of 2 lb 13 oz, with a mixture of pouting and rocklings. 5th Ben Laws with 1 rockling for 05 oz. Total monthly weight of fish.